What is the Virtual Football League? The Virtual Football League (VFL) consists of 16 teams which play a full season within a very short space of time - this consists of 30 match days, each of which last 4:35 minutes. A season consequently runs for 150 minutes. It is possible to start a game at any time - even during an on going season. The results of virtual games are determined by an independent Random Number Generator, which cannot be manipulated and was certified in accordance with the Gambling Commission. The race simulation combines artificial intelligence with the use of independent Random Number Generators. At the same time, the performance parameters of the VFL-players are based on professional football players (e.g. with regard to the number of goals, ball-passing accuracy, ball-winning ability in tackles). Virtual Football League enables the user to place bets on virtual games around the clock. Settlement of the bet takes place directly after the match day - there is no faster way! The important events of all current games (goals and sending off/red cards) are even displayed on the Ticker above the video player and the results. The highlights of the games can be viewed on the video player. Users will not miss a thing - goals, red cards, off sides, even the teams walking onto the pitch! The sound of the video can be turned on or off and if desired the video can be played in full-screen mode. The Event Ticker summarizes all the important events of the game that are being played on the video player above. The Live-Events display the current games on the particular match day - so all games are visible at a glance. By clicking the statistics icon, extensive statistics on the Virtual Football League can be invoked. It is also possible to load the appropriate game to the video player. Moreover, formations and tactics of the teams can be assessed. By clicking this icon, extensive statistics on the Virtual Football League can be invoked. Teams, players, seasons - everything the heart desires! All eight games are available as video. Users can switch between the games during one match day. Virtual Trainer Insight into the tactics will vouch for ideal game preparation. Underneath are the league tables, which are constantly updated and therefore always provide an overview of the current situation in the league. This bar indicates which phase of the game round is currently running, and subsequently imminent. A distinction is made between Start of game (60 seconds), 1st and 2nd Half-time (90 seconds each way), The half-time interval (10 seconds), End of game (10 seconds) and the End of match day (15 seconds). A bet for the upcoming match day can be placed in the “Start of game” phase up to 10 seconds before the end; from this point onwards, bets are only accepted for subsequent match days. This is where the complete game plan of a season can be viewed. The currently running match day is highlighted in yellow-orange, where as the next round of the game is highlighted in blue. Previous match days (green background colour) can also be viewed. Not only the results but also the successful betting odds are posted. It is also possible to place bets in advance of match days. This can be performed by simply selecting a match day in the future (white background colour). This section enables the placement of different bets for different types of bets. By clicking the statistics icon (to the left of the encounter) the forthcoming game can be invoked for every game. 1. End result: The classic "Who will win the game?" - Bet. “1” represents the home team, “2” represents the away team and “x” is selected for bets placed on a draw. 2. First goal: Which team will score the first goal of the game? Once again, “1” represents the home team and “2” represents the away team. “x” is selected when it is assumed that no goal will be scored. 3. Half-time: This type of bet addresses the question: Which team will win the first half - from that perspective, the game only lasts 45 minutes. The importance of “1”, “x” and “2” is identical to the “end result” type of bet. In this context, one of the opponents gains an advantage (of course only on the betting ticket), which is added to the actual result. This becomes interesting when a game already has a clear favourite, however, the odds for a simple result bet are too low. 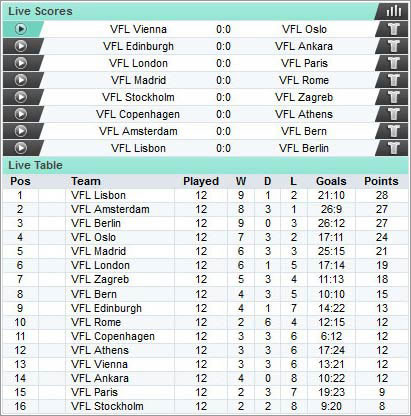 In the following example, Oslo is one goal ahead of London. Bet 1 wins if London wins by a difference of two goals or more (Real result 2:0, Result based on handicap calculation 2:1). Bet X wins if London wins by a difference of exactly one goal. (Real result 2:1, Result based on handicap calculation 2:2). Bet 2 wins, if the game ends in a draw (Real result 1:1, Result based on handicap calculation 1:2). Bet 2 also wins, if Oslo wins, whatever the goal difference. (Real result 0:1, Result based on handicap calculation 0:2). How many goals will be scored in the game? For example, if a bet is placed on more than 1.5 goals being scored in one game, then at least two goals have to be scored in order to win the bet. As the name already suggests - the bet is placed on the exact result of the game. There is a wealth of possible outcomes, by far however with the highest and most attractive odds! The bet slip works no differently to regular sports betting. It is possible to select between single, combi and system bets, to view the current balance of the user account and to bet the desired amount. Furthermore, by clicking “My bets”, it is possible to invoke the user’s bet history, look at whom the user placed bets on and to check whether the user’s bet has won.